New to healing? I know, it can be overwhelming. But there are some energy healer basics, essential things that will help you get started and feel confident. Below, I've compiled some of these basics: helpful ways of thinking about energy healing, plus a list of what I think are the most essential and helpful resources on my site. simple healings can be very powerful. For example, just being a compassionate witness or presence can be powerfully healing. 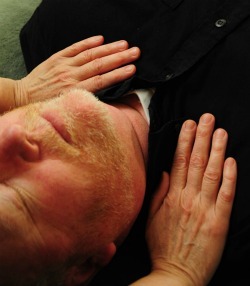 Learn some of the core principles of energy healing. These will give you a deeper understanding of the world view and philosophical foundations of energy healing. It's a different model of reality! The human energy field has specific features, just as the physical body does. Learn about subtle anatomy: chakras, auras, meridians, and more. You should go into a healing session in as elevated a state as you can. Learn about grounding, centering, raising your vibration, setting an intention, and releasing attachment to outcome. Learn how to center, a fundamental principle in managing your energy and preparing for a healing session. Learn some of the most basic techniques of energy work, including scanning, modulating, sweeping and magnetizing. The power of intention: what it is, how to create effective intentions and how to use them in healing work and life. Along with intention, simple presence -- mindful witnessing -- may be the most deeply transformative practice available to you as a healer and a self-healer. Learn about presence, including a Healing Presence Meditation. Muscle testing (also called energy testing or applied kinesiology) is a way to get direct information from -- to read the energy of-- our bodies and energy systems. Learn how. It's important to keep your energy distinct from your clients'. Learn how. Learn 26 fun exercises to help cultivate your right brain hemisphere, and how right-brain mode is a conducive state for healing. When you become a healer, and/or if you are energetically sensitive, you have to take special care of yourself, both when you are doing energy work and in your daily life. What is your intuitive style? Visual, auditory, empathic, kinesthetic, environmental? Even just knowing that there ARE different styles will help you tune into your intuition. It's important to clear our treatment spaces after doing energy healing. Learn some ways to do space clearing -- ideas that work for your office as well as your home and any other space. Healers have special ethical responsibilities to their clients. Because of the nature of our work and the trust that our clients place in us, we must operate with the highest level of care and integrity. Sometimes you need some real-life examples of how a session might go. Here is a growing set of case studies to show how all of these energy healer basics might come together in actual treatments. There are some good tips in this section, especially in the "Energy Healing Issues" category. More resources for learning energy healing, including books, schools and online resources. And by the way, if you're interested in learning about energy, energy healing, and chakras in easy-to-understand language and all in one convenient place, check out my book, "Chakra Care: Do-It-Yourself Energy Healing for a More Joyful, Loving, Fruitful Life". In it you'll also find 500 ways to clear, nurture and support your own chakras. Chakra Care is a just-right explanation of the chakras for beginners, but it has loads of fresh ideas and perspectives for more experienced energy workers, too. I hope these energy healer basics are useful to you and help you find your way through the thicket of information about energy healing. Keep checking back, as I add more resources from time to time. Go from Energy Healer Basics to site home page .